While The Venue Report’s always interested in the dives, drinks, snacks, facts, and tips of any locale, Nashville in particular was on our radar for some major investigating. The state capital, long ago donned “Music City,” kicks up its heels on the riverbank with a good spirit of nightlife. Curious to know more, we decided to send some of the best explorers we know to the hot spots and cool spaces out there on the Cumberland. So when the wandering band of designers, photographers, and musicians, known by their reborn name of Get Lost With Us, agreed to the adventure, we were so excited. The crew is made up of designer Tori from Sitting in a Tree Design, DJ Austin Hendrix and photographers Studio Castillero. 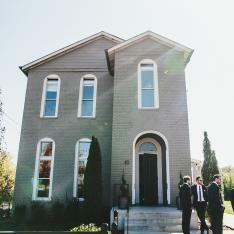 The crews first stop was the designer pad of Colleen Locke. If you are not familiar with Colleen, you should be! When it comes to the stylish stays and definitive design of Nashville, one name will likely enter the conversation: Trot Home. Founded by designer Colleen Locke, Trot’s place in Nashville’s radiance is a familiar southern preference of strong family love and warm, welcoming comfort. Prior to Trot, Colleen refurbished homes, ran a brick-and-mortar vintage home store, and raised kids. It gave her the well-rounded experience necessary to be capable of transforming any living room into a lively room. So once she and her husband moved to Nashville, Locke made her interior design talents known with one of the most trusted companies around. Locke has a unique answer to what makes the most important element of any venue: people. “You can have a beautiful, impeccably designed space, but if it is empty, it is lifeless,” she says. And it makes sense when you see one of her interiors. Rooms practically invite you in and quietly suggest you stay awhile without bombarding you with knick-knacks and the chaos that comes with forcing a room’s charm. The beauty of Locke’s interior design work actually resides in her subtly. Creamy white walls make each chandelier or ottoman a purposeful character in the home’s landscape. That sense of placement can be difficult, but Trot’s made a name for itself by cleaning up atmosphere of a home while adding to it. A touch of brown in a chair or selected use of iron in a table does the trick of making it seem like the only thing missing from a room is you. If you can't tell, we pretty much fell in love with Colleen. So with that said, we asked 20 questions to the lucky Get Lost With crew about their stay at her designer pad. TVR: What were the highlights of your experience at the venue? GLWU: The design of the home was amazing. Basically, there was a jar of candy in every room, so that was kinda the best. TVR: How’s the location and capacity? GLWU: Location was great. Easy drive to the city, food and stores nearby, beautiful neighborhood—amazing. Well-designed and could sleep at least 7 or 8. Maybe more if you count couches. TVR: What makes it a great gathering space? GLWU: It's absolutely beautiful. Stunning. I feel like I walked into the pages of a magazine. I didn't want to leave. TVR: What types of events is the venue ideal for? GLWU: Smaller, more intimate gathering; brunch, group getaways, dinner parties for sure, showers definitely. 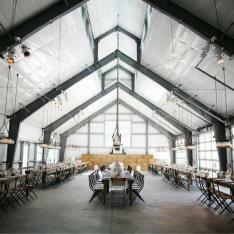 TVR: Favorite design elements of the venue? GLWU: I loved how every inch of the place was well-designed. The kitchen was amazing. The family room and the mini bar? Hello! Definitely utilize the killer dining room. An intimate dinner party around that table would be magic. TVR: Is there anything existing on the property or the town that you would incorporated into a gathering here? GLWU: Since it was a little bit of a drive to the Nashville city area (~15 minutes), it depends on how close you mean. But Nashville in general is amazing. The property itself is smaller. The backyard is super cute; could make for a good garden shower or cocktail party. Well, since Nashville is a mere 15 minute drive. It only makes sense that you go explore right?! Did you know that the NY Times voted Nashville one of the top 52 places to go in 2014? The city comes alive at night. Stop by for some Honky Tonk at Robert's Western on lower Broadway. The building is steeped in history and has been witness to many famous musicians that have played within it's walls. One of the many things that makes Nashville magical, is that any band you are listening to could potentially be the next big thing. It's a bustling city for dreamers, we love that. Nashville was ranked #3 by Travel and Leisure as one of the best cities to get ice cream! You can get fun flavors like whisky pecan and the Lady Goo Goo, a chocolate ice cream with marshmellows and chopped goo goo clusters. You will also find charming horse drawn carriages. If you are lucky, you will see one with a dalmatian in it! The Get Lost With Us crew, gave the entire experience a thumbs up!